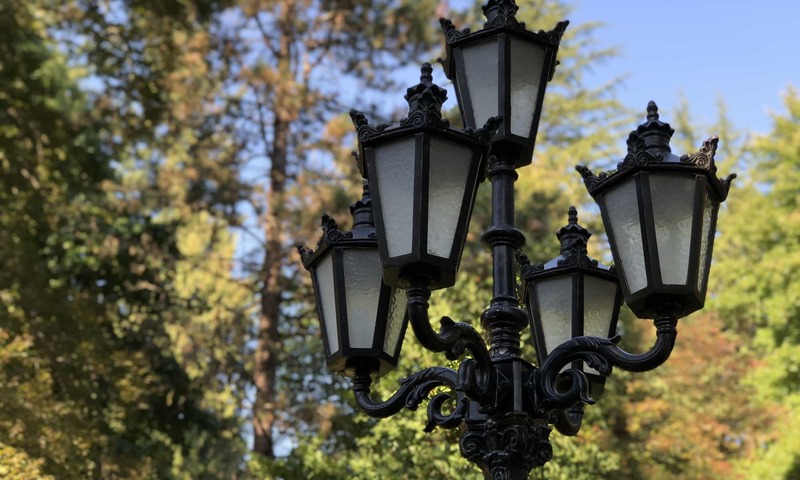 The memorial features a stone bench adorned with wrought-iron gating, screened from the street by rhododendron bushes. The bench sits behind a circular, cobblestoned area – simulating a town square. During the Holocaust, many Jewish families were gathered in town squares before being loaded onto trains and taken to concentration camps. The square contains scattered bronzes of shoes, glasses, a suitcase, and other items to represent everyday objects that were left behind. 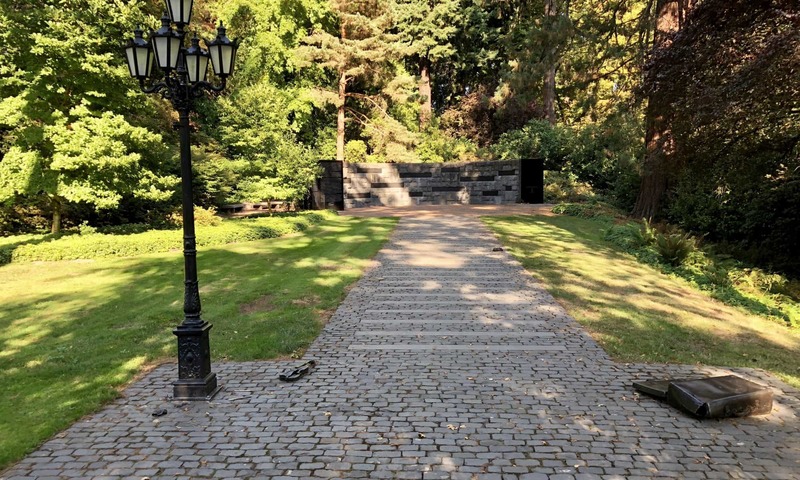 A European-style, cobblestone walkway with inlaid granite bars, simulating railroad tracks, leads to a wall of history panels – giant, stone placards that offer a brief history of the Holocaust and quotes from Holocaust survivors. At the end of the wall is the soil vault panel. Buried below the panel are interred soil and ash from six killing-center camps of the Holocaust – Chelmno, Treblinka, Sobibor, Belzec, Majdanek, and Auschwitz-Birkenau. The back of the wall is engraved with the names of people who died in the camps, followed by the names of their surviving relatives in Oregon and SW Washington. Total square footage of Memorial site: 23,850 sq. ft.
Total area covered by hard surface materials: 3,500 sq. ft.
Town Square is paved with recycled Belgian cobblestones donated by the City. The Wall is 50 ft. in circumference and 9 ft. tall. The Witness Wall is covered in native Oregon natural basalt stone. Soil Vault rock weighs approximately 25, 625 lbs. Granite panels collectively weigh 58,000 lbs. 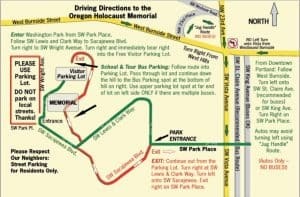 Click through the SlideShare below to get a deeper look at the thematic organization of the Oregon Holocaust Memorial. Move your cursor over the image below to get more information on the layout of the Memorial. 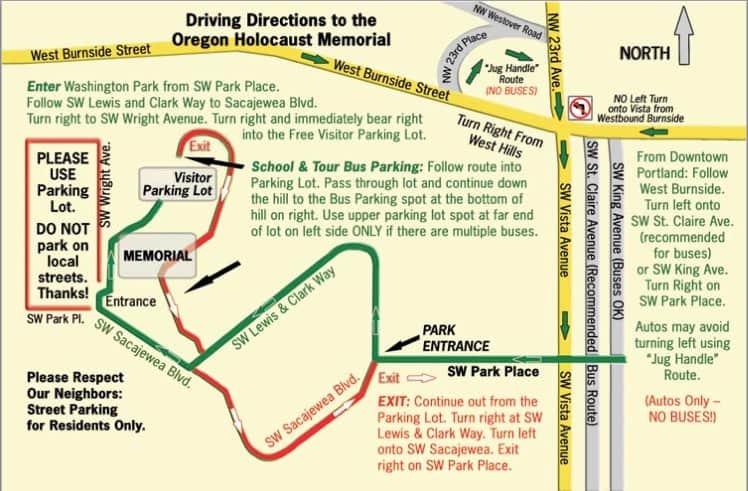 Interested in visiting the Oregon Holocaust Memorial with your class or organization? Click here.